Sarah and I have been making strides to be more active in our local community by jumping into a "get fit for summer" 5k series that is happening in town (see what I did there - pretty punny huh?). Never mind the fact that neither of us is in 5k shape, especially since that is the whole point of doing a series to get in shape right? Still though, I have always found it just a little bit difficult to run a distance I have raced so many times - times when I was in good shape. The comparison hurts my heart... brain... pride... soul... maybe everything. Oh well - as you can see we have taken Breakaway Running's shirt slogan quite literally (and it's true, I still try to buy my Pearl Izume shoes as often as possible from my brother and the boys at Breakaway in Memphis - brought two pair with me to NZ - if you need some running shoes go check them out and tell em ole Brett sent you. They might even tell you stories that are only mostly true! 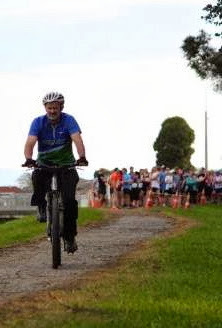 The local folks threw up some pics from the race on their Facebook group Sport Southland (we are in the South on the Southern Island of NZ - you can like their page and keep up with what folks half a world away do to keep fit and celebrate in the process). This 5k ran around some flood banks on the northern edge of town just off the Waihopai River (a Maori word meaning "the water of Pai" - I have not learned who Pai is yet or why they named the water after him but if I do I will fill you all in) in two big loops to make up what the race director announced before hand is a 5.513k - trying to keep any serious GPS wearing runners from getting to upset. It's a runner thing if you are wondering. The path is one that runs up and down the river in both directions (and on both sides for a good portion too) for as far as I could see. And I know for certain that this path runs around the city to connect with the paths that are right by our house we are living in now! That, however, is farther than either Sarah or I am willing to run or bike at the present. Ok, ok, even though it was just a 5k to get in shape I bet there are still a few of you wondering how Sarah and I did in this whole deal. Well Mom, I finished third overall, and as you can see from this very terrible picture (that I also snagged from the group FB page - thank you Southland Sports) it was not the fastest, easiest, or prettiest 5k that Sarah or I have run. Sarah finished well too and hit almost dead on exactly what her time goal was for her first 5k back in three years (sorry I could not find any pics of her on there). It was not until talking with Sarah after the run was over I understood it had been so long since she had run a 5k. I did not realize that with all of the work Sarah had been doing in residency during our time in Norfolk that she had not run much at all (admittedly she later said she could have run more - but residency was tough and I am surprised at times that she was still making it let alone exercising). 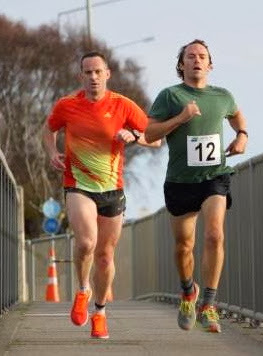 We both started off well enough and felt decent for the first loop (the picture of me running here was taken right as that loop was ending, along with the good feelings - oh and the other guy ended up getting first. He does look better in the photo doesn't he?). Neither of us expected much, both of us enjoyed the run and getting out in the fantastic weather, and suffice it to say we both slept well that night. Best overall is we are looking forward to the next six Thursday evenings in a row and the opportunity to be outside and running. I am still not used to this, but Sarah will be able to make all but one of the remaining runs! It is so nice to have a wife with relatively normal work hours - praise God! Well if there is one thing I have learned you have got to get the race out of your legs after you run. Oddly enough the best way to do this is to do something active (but not as strenuous the next day - usually a nice easy run for instance). This time we did a nice long walk. New Zealand is famous for their Great Walks (that's one link you will really want to click on), or 3-7 day long hikes (they call them treks or tramping in everyday talk). I know what you are thinking and the answer is "yes, we are planning on doing a few of them." These posts will come later. Today, however, we simply drove ten miles down the road and pulled off to do what are known as the Short Walks of the Southland. It's amazing how many there are just right outside our door! I believe after today we will be able to cross off our sixth or seventh short walk in this area. Well as always the tendency is to write too many words and not just let the pictures speak for themselves. We encourage you if you ever have questions or would like to know more about anything we mention or you see to just comment below the post. One of us will jump back on here and chitter chatter to your heart's content on whatever it is we can fill you in on. Till next post just keep wondering exactly how one is to stay above the treacherous tsunami hazard as is shown in this photo in the park? Is this person running on water? (There are not many tsunamis in this area but as we have all seen in the world news the past few years they can be bad news - so better safe than sorry and put the signs up). Enjoy the pictures and have a great Friday! Good night from NZ.